Can you have the victory tour before the victory? It sort of feels like that's what Marc Márquez is doing this week as we lead up to the Red Bull Grand Prix of the Americas, the lone MotoGP appearance in North America. In this case, maybe you can have the victory tour in advance, because if there's anything close to a sure thing in MotoGP racing, it's Marc Márquez winning in the United States. As MotoGP comes to Austin, Texas, this weekend, with the MotoAmerica EBC Brakes Superbikes as a support class, Márquez will be trying to sustain an incredible streak: He has won every MotoGP race he has ever competed in on U.S. soil. Given the tour he has been on this week, he should be rested and fully entertained by the time practice starts tomorrow. After leaving Argentina after the last round, he attended to duties in Brazil for sponsor Estrella Galicia 0,0 and then posted a selfie with his brother, Álex, and Xavi Vierge, both of whom ride for the Estrella Galicia 0,0 Marc VDS Team in Moto2, taken in Miami. Next he was sighted in Nashville for the Monster Energy Supercross round. Making his way down to Texas, he took in a Houston Astros game one night and a Houston Rockets game the next. 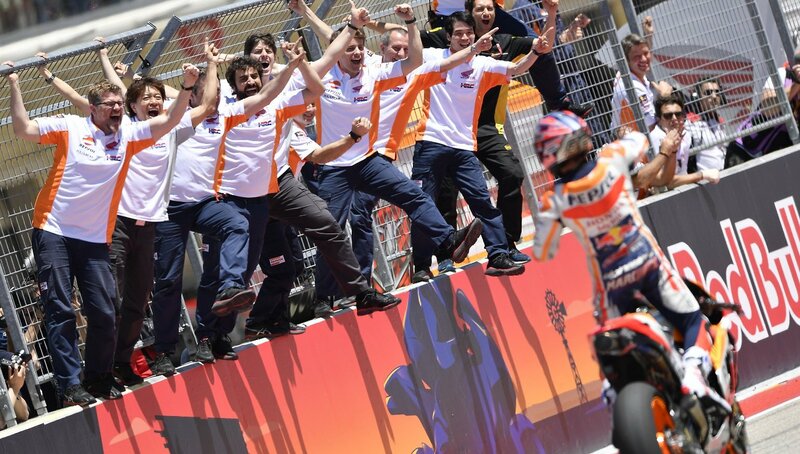 With the winning streak Márquez has, why not have fun and feel relaxed? Consider what he has done at COTA, alone. As impressive as Márquez's winning streak at COTA may be, it's only part of an incredible string of wins. Márquez has won every MotoGP race in the United States since he moved up to the top class in 2013, all 10 of them, with a win at WeatherTech Raceway Laguna Seca in 2013 (the year there were three MotoGP races in the United States) and wins at the Indianapolis Motor Speedway in 2013, 2014 and 2015. If a 10-for-10 MotoGP record (not to mention two Moto2 wins at Indianapolis) doesn't make you inclined to enjoy your annual trips to the United States, then good seats at a Rockets game aren't going to help, either. Those U.S. wins included both lasting milestones and dramatic moments, too, such as Márquez's 2014 victory at Indianapolis to tie Mick Doohan's modern-era record of 10 consecutive wins, or the dramatic qualifying session at COTA in 2015 when Márquez's motorcycle died with three minutes left, so he jumped over the wall, sprinted back to the pits, hopped on his backup bike and put in a new fast lap to take pole position. One other note. Last year, turn 18 at COTA was named Hayden Hill and this year Nicky Hayden's number, 69, will be retired in MotoGP. That leads to one more social media post I can't resist sharing. It was posted by Nicky's sister, Kathleen Hayden, and showed a photo of her son, Colt — alongside another photo from the past. The past, present and, who knows, maybe the future. Let's see what happens this week in Texas.